So yesterday I got a mini haul because I just couldn't resist the spring colours out on the shelf! 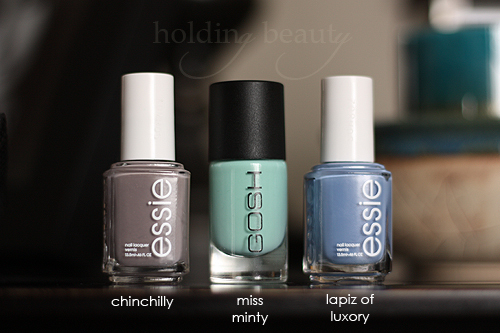 I got a beautiful minty green Gosh Miss Minty, a sky blue Essie Lapiz of Luxury, and a greige that I've been wanting Essie Chinchilly. 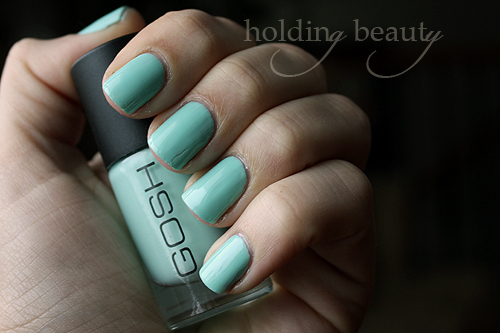 For today, I present you with the swatch of Gosh Miss Minty. It's absolutely wonderful and gorgeous and springy. 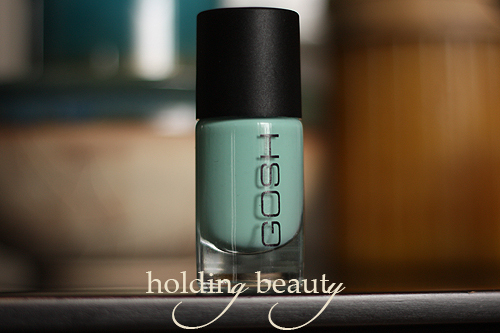 It's very similar to Essie Turquoise and Caicos. This is the perfect colour for the "in" colours this spring. The formula was thick and a bit streaky; it needed patience to get solid and some of my fingers could have used a third coat, but I decided to stick with two. It evens out pretty good by itself, which is good because it tended towards that ridged streaky side. It's definitely worth working for, the colour is amazing. Are you excited for the spring collections? Gorgeous color! I cannot wait to see more Spring polishes.